2019 Q50 3.0t LUXE: MODEL#90519 Example: Vin# KM519773 Excludes, taxes, title & license. Retailer participation required. Initial payment required at consummation (includes $1995 consumer down payment, Plus Tax and Fees). Vehicles subject to availability to well-qualified customers who finance their lease through INFINITI Financial Services. Subject to credit approval. MSRP $39,295 includes destination charge. Net capitalized cost of $31,641.77 includes a $700 non-refundable acquisition fee. Retailer contribution may affect actual price set by retailer. Monthly payments total $11,661. At lease end, purchase for $20,040.45 plus $300 purchase option fee plus tax, or pay excess wear & use plus $0.25/mile for mileage over 10,000 miles/year. Lessee is responsible for maintenance and repairs. Disposition fee due at termination of lease. No security deposit required. Must take delivery from new retailer stock. See INFINITI of ONTARIO for details. Offer ends 04/30/2019. Supplies of vehicle may be limited in some regional areas. Retailer inventory varies. Subject to residency restrictions. Vehicle photo is example only. Vehicle may not be exactly as shown. 2019 QX30 PURE FWD: MODEL#80119 Example: Vin# KA008000 Excludes, taxes, title & license. Retailer participation required. Initial payment required at consummation (includes $359 consumer down payment, Plus Tax and Fees) Vehicles subject to availability to well-qualified customers who finance their lease through INFINITI Financial Services. Subject to credit approval. MSRP $31,645 includes destination charge. Net capitalized cost of $23,465.75 includes a $700 non-refundable acquisition fee. Retailer contribution may affect actual price set by retailer. Monthly payments total $14,001. At lease end, purchase for $13,290.90 plus $300 purchase option fee plus tax, or pay excess wear & use plus $0.25/mile for mileage over 10,000 miles/year. Lessee is responsible for maintenance and repairs. Disposition fee due at termination of lease. No security deposit required. Must take delivery from new retailer stock. See INFINITI of ONTARIO for details. Offer ends 04/30/2019. Supplies of vehicle may be limited in some regional areas. Retailer inventory varies. Subject to residency restrictions. Vehicle photo is example only. Vehicle may not be exactly as shown. 2019 QX50 2.0t PURE AWD: MODEL#81019 Example: Vin# KF134253 Excludes, taxes, title & license. Retailer participation required. Initial payment required at consummation (includes $995 consumer down payment, Plus Tax and Fees) Vehicles subject to availability to well-qualified customers who finance their lease through INFINITI Financial Services. Subject to credit approval. MSRP $39,345 includes destination charge. Net capitalized cost of $34,985.95 includes a $700 non-refundable acquisition fee. Retailer contribution may affect actual price set by retailer. Monthly payments total $14,781. At lease end, purchase for $22,820.10 plus $300 purchase option fee plus tax, or pay excess wear & use plus $0.25/mile for mileage over 10,000 miles/year. Lessee is responsible for maintenance and repairs. Disposition fee due at termination of lease. No security deposit required. Must take delivery from new retailer stock. See INFINITI of ONTARIO for details. Offer ends 04/30/2019. Supplies of vehicle may be limited in some regional areas. Retailer inventory varies. Subject to residency restrictions. Vehicle photo is example only. Vehicle may not be exactly as shown. 2019 QX60 3.5 PURE FWD: MODEL#84519 Example: Vin# 559653 Excludes, taxes, title & license. Retailer participation required. Initial payment required at consummation (includes $0 consumer down payment, Plus Tax and Fees) Vehicles subject to availability to well-qualified customers who finance their lease through INFINITI Financial Services. Subject to credit approval. MSRP $45,245 includes destination charge. Net capitalized cost of $40,141.75 includes a $700 non-refundable acquisition fee. Retailer contribution may affect actual price set by retailer. Monthly payments total $15,561. At lease end, purchase for $24,884.75 plus $300 purchase option fee plus tax, or pay excess wear & use plus $0.25/mile for mileage over 10,000 miles/year. Lessee is responsible for maintenance and repairs. Disposition fee due at termination of lease. No security deposit required. Must take delivery from new retailer stock. See INFINITI of ONTARIO for details. Offer ends 04/30/2019. Supplies of vehicle may be limited in some regional areas. Retailer inventory varies. Subject to residency restrictions. Vehicle photo is example only. Vehicle may not be exactly as shown. 2019 QX80 LUXE RWD: MODEL#83119 Example: Vin# K9680038 Excludes, taxes, title & license. Retailer participation required. 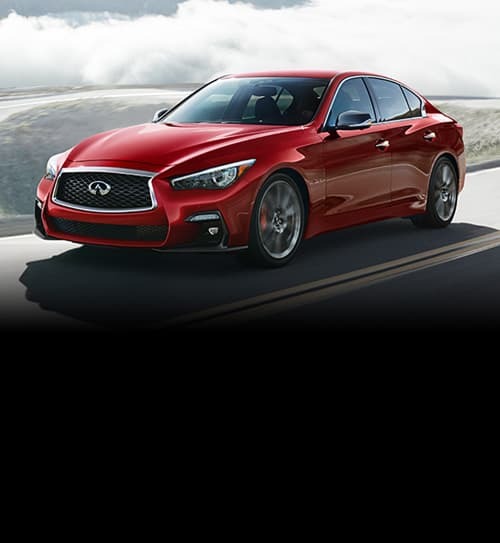 Initial payment required at consummation (includes $2995 consumer down payment, Plus Tax and Fees) Vehicles subject to availability to well-qualified customers who finance their lease through INFINITI Financial Services. Subject to credit approval. MSRP $67,100 includes destination charge. Net capitalized cost of $56,419.78 includes a $700 non-refundable acquisition fee. Retailer contribution may affect actual price set by retailer. Monthly payments total $28,431. At lease end, purchase for $36,905 plus $300 purchase option fee plus tax, or pay excess wear & use plus $0.25/mile for mileage over 10,000 miles/year. Lessee is responsible for maintenance and repairs. Disposition fee due at termination of lease. No security deposit required. Must take delivery from new retailer stock. See INFINITI of ONTARIO for details. Offer ends 04/30/2019. Supplies of vehicle may be limited in some regional areas. Retailer inventory varies. Subject to residency restrictions. Vehicle photo is example only. Vehicle may not be exactly as shown. Everything you want... Everything you need! INFINITI of Ontario offers an impressive selection of new and pre-owned vehicles. Our staff makes the process of buying your next vehicle easy. Browse our complete inventory of new and certified pre-owned vehicles and learn more about our various financing options. Call (909) 284-9102 to schedule a personal one-on-one guest drive, go online or stop by our store and talk to us in person. Our goal is to get you behind the wheel of a vehicle in-sync with your lifestyle with minimum hassle at your Chino INFINITI dealer alternative. And also to make sure that the process is a smooth one. We also serve Pomona INFINITI customers at our dealership.